Sometimes, when we've been at something for a long while, we hit a bump. It's not burnout exactly. It's more like a fizzle. Willa has tentatively identified it as a bit of a midlife crisis. Whatever it is, I was ripe for it this summer. And, when I consider that I spent the whole summer out of my comfort zone, speaking, traveling, and packing a child to leave for the very first time, I am astonished to find that I'm not fizzling with my friends. Instead, God planted a seed in June that grew, little by little, over the hot, dry summer. I found myself sitting with my nursing baby in a hotel room in Denver with my friend Kim and her nursing baby. Kim had just given a talk on notebooking. Donna Simmons had been very kind to furnish Kim with lots of samples of Main Lesson books to use during her talk. She'd also supplied Christopherus catalogs. And there, Kim and I set about reminiscing. We remembered the idealistic beginning of our homeschooling adventures. We began a conversation that lasted all summer and into the fall. Our enthusiasm for an arts oriented infusion of new life bubbled over and we started sharing it with friends. I spent hours in the car, driving from Virginia to Florida, back to Virginia and then to New York. Along the way, I talked to my favorite artist about his education, I chatted via cell phone about the things I was reading, and I listened to a lady named Donna Simmons (on audio downloads) discuss big ideas that pretty much fizzle-proofed me. But I have these books that are littered with post-it notes and colored with Lyra penciled underlining. These are nuggets of wisdom from Donna Simmons and I do want to pass them along. Lots to think about here, lots to encourage and lots to inspire. "This is why I'm not very keen on set curricula--I feel that no one can anticipate just what each individual homeschooler needs to make her homeschool work. And though many people initially take great comfort from 'having it all there,' the help can turn into a hindrance when family circumstances do not allow for the blocks or lessons to proceed as they're written down. What happens then is usually frustration which can lead to burnout." "If, however, parents acquire curricula to have as resources and sources of inspiration, not something to follow the letter, then I think it can work wonderfully. So my advice is: get all the materials you can afford and be creative in how you adapt them to the needs of your family." 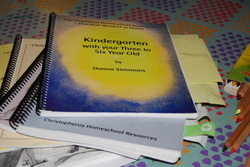 "To my mind, family is the number one reason to homeschool. I feel that for many people, homeschooling is the way for them to build truly healthy families which nurture healthy individuals. Within such a setting wonderful educational opportunities can arise and by working with Waldorf, which is concerned with each individual's health, we can watch our children and families flourish." ...To these is then added "From knowledge to understanding" as the children move up into high school." "And so in our homeschools, we can use this wise approach to material by developing an overlapping rhythm whereby we tell a story, for instance, on the first day and then leave it to do other things, other material from the Main Lesson. The following day we ask the child to retell the story: this alone is an extremely valuable thing to do, strengthening both the listening skills and memory of the child. With the little ones, you'll have to help them along and gently steer them back on track: some children will that the story as a jumping-off point for their own story adventures! One will have to be sensitive and not crush such enthusiastic imaginings if this is the case, but one does want to encourage accuracy of recall. Older children should be able to retell material in some depth and their questions can form the basis for discussion. You may choose to pause before discussion and instead work artistically with the material at hand, drawing, painting, writing poetry or whatever seems right." "One thing to caution against is fashioning your children's school days only in accordance with the needs of your eldest. It's tempting to do this, but it would be good to have regular 'kindergarten time' or even 'baby time' at intervals, too." "Don't worry if everybody's doing everything and that there are so many of you that nothing seems to get done! Hold onto three three things: 1)the belief that the life you have chosen, including homeschooling, is best for all of you; 2) that each of your children will learn no matter what, even if the form the learning takes is a bit unorthodox; and 3) that having a big family is in and of itself a wonder thing and that, although it may mean all sorts of compromises, the very fact of being in a large family is right and nurturing for each of your children." "What I'm trying to get across is for parents to neither be so purist that a plastic farm animal will never be seen in their house nor to be so inattentive to the quality of their child's toys that they buy Barbie disco sets! Quality does matter, children are either nourished or dulled by their playthings. But, as always, one wants to look at the larger picture. If the child has a peaceful home environment, if she's not overstimulated by electronic media or 'educational' toys, if she has plenty of open-ended, creative playthings and is allowed to engage in meaningful work around the house, then a few plastic toys aren't the worst thing going." "Your task is to find fulfillment in your role as homeschooling Mom...and homemaker and to ensoul your home with your love and peacefulness. Self-education and self-development are a huge part of a Waldorf teacher's vocation: it can be no less the case with homeschooling parent!...The point is for you to work on your inner development, cultivating the artistic, practical, intellectual and spiritual sides of who you are. Not only can such work bring you satisfaction and clarity in your own life, but it will better enable you work with your children in the holistic way we all wish for."